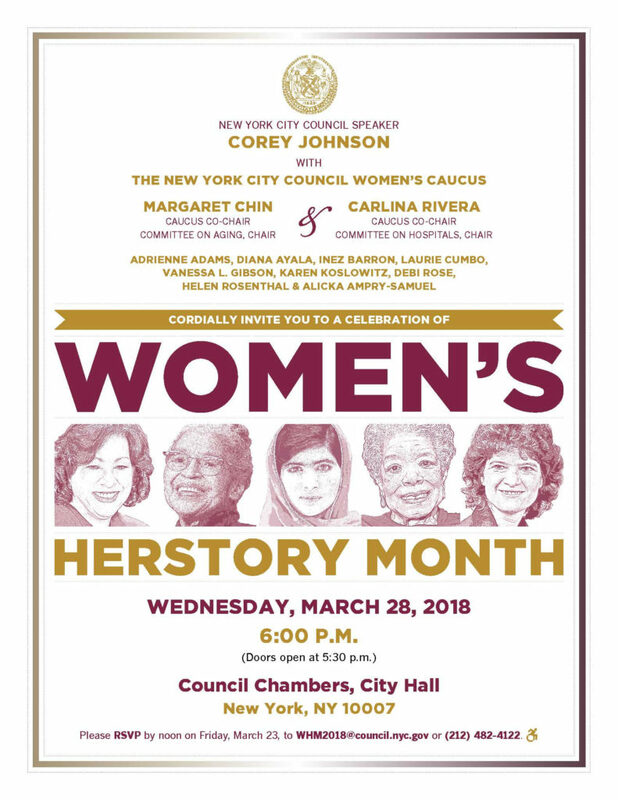 Please join us on Wednesday, March 28, 2018, as we celebrate Women’s Herstory Month at the New York City Council. The invitation below contains additional details about the event, which is scheduled to begin at 6 pm in the Council Chambers of City Hall. To RSVP, email WHM2018@council.nyc.gov or call (212) 482-4122. And please feel free to invite your family, friends and neighbors. All are welcome to join us for this important event! For nearly five decades, Assemblyman Herman “Denny” Farrell has been a fierce advocate for New York families. Now I’m excited to invite you to attend an event renaming Riverbank State Park in honor of Assemblyman Farrell in recognition of his lifetime of service to the Northern Manhattan community. Please RSVP to join us on Tuesday, September 5th, 2017 for the formal dedication ceremony for Denny Farrell Riverbank State Park. Sign up now. I look forward to seeing you at the ceremony. The ugly events that took place in Charlottesville must never be repeated, and in New York we are taking a united stand against hate in all of its forms. In the aftermath of the violent and deadly events in Charlottesville, I am advancing legislation to add the crimes of inciting to riot and targeted rioting against people based on their identity including, race and ethnicity, to the list of specified offenses under New York’s hate crimes law. In addition, I’m calling on legislative action to amend the Human Rights Law to protect all public school students and institutions from discrimination. Known as the ‘Charlottesville provisions,’ the changes will reaffirm that while peaceful demonstrations are allowed, New York will never tolerate advocacy or the incitement of imminent violence against protected classes within our communities. As New Yorkers, we must always stand together against hatred in all forms. Add your name now and become a citizen co-sponsor of these proposed changes to strengthen our hate crime laws. Our diversity is our strength and this legislation will help protect public safety and send a clear signal that violence and discrimination have no place in our society. New York is one community and one family, and we will never stop fighting to ensure the safety and equal treatment of all New Yorkers. Friend — you have surely seen the pictures. Cowards carrying tiki torches marched through the streets of Charlottesville and the University of Virginia, chanting racist and anti-Semitic slurs. Make no mistake: This was an act of domestic terrorism by those who feel emboldened by President Trump, his election, and the administration he’s installed. I spent the weekend thinking about the Jewish practice of tikkun olam, repairing the world. While they preach hate, we must all be watchmen for everything that our American flag stands for. Our future will be defined by people like Heather Heyer, who died last weekend fighting for what she believed in, standing up for inclusion in the face of hatred. Our future will be written by our heroes — first responders like Lieutenant Cullen and Trooper Bates — who worked to keep Charlottesville safe. Our future will not be defined by a president who sees “many sides” to the violence in Charlottesville, nor by those who brought their hatred to Virginia. Instead, together, we’ll “repair our world” in a quest for peace. We will stand together to bend the arc of the moral universe towards justice. From the vigils across the country this week, to the long and noble work of pursuing our righteous American values of inclusion and empathy within our communities, I know there’s a long path ahead of us. But today, I’m grateful to be on the path towards justice with you. This weekend’s events in Charlottesville, Virginia were disturbing and frightening. They showed, without a doubt, that the cancers of White Supremacy and anti-Semitism are alive and growing in the United States. The toxic beliefs of the KKK and neo-Nazi aligned protestors in Charlottesville, fueled by hate, bigotry, and racism directly echo those of the Nazis that millions of Americans, including my father, fought so gallantly against in World War II. History shows us that we cannot wait to speak out, the time is now. We must stand strong against this kind of hateful ideology and the violent actions we witnessed this weekend. Unchecked, this movement will only grow to be even more dangerous. In an act of domestic terrorism, Heather Heyer, a young woman standing up for peace and unity, was murdered this weekend by a White Supremacist who also injured twenty others. This is beyond unacceptable and must be unequivocally condemned by all Americans. It is also incumbent upon the federal government to prosecute this individual to the fullest extent of the law and take active steps to combat hate online, on college campuses, and in our communities. In matters as important as this, silence equals consent; and I will not be silent. We need to call this weekend’s actions what they are; hate and terror. With the political news of this week – Senator Dan Squadron is resigning effective tomorrow and our Assemblyman Brian Kavanagh has announced that he is running for that seat there will be lots of activity in the Tilden area. This is where County Committee comes into a very important role. The County Committee representing Sen. Squadron’s District will nominate the Democratic candidate to replace him and that election will take place on Election Day in November. The County Committee in the 74th Assembly District will then nominate a successor to Brian Kavanagh if Brian is successful in his quest for the Senate seat. That would result in a special election to be called by the Governor after January 1st. This is why we petition for County Committee and take these positions very seriously. We are so glad you are part of the process. Kavanagh says he’ll seek Squadron’s Senate seat. ALBANY — Assemblyman Brian Kavanagh announced Wednesday that he will seek the state Senate seat that is being vacated by Daniel Squadron. Squadron, a Democrat, announced earlier Wednesday that he was stepping down to focus on improving the quality of state legislative candidates nationwide. The two members have a long-standing working relationship. Nearly a fifth of Squadron’s bills are sponsored in the Assembly by Kavanagh, including a measure that would lower the size of campaign contributions that limited liability companies can make and one to let liquor stores sell maraschino cherries. They’re also roommates, having shared an apartment in Albany on session days. Their two seats only overlap in part. The southern border of Kavanagh’s Assembly district is the Williamsburg Bridge, and it stretches north to East 51st Street. The now-vacant Senate district is bordered on the north by East 5th Street, and contains most of Manhattan below that point. It also includes a swath of the northern shore of Brooklyn, which includes 74,247 of the district’s 188,137 registered voters. Since the seat will be filled by a special election, Democratic party leaders in the two boroughs will select their candidate. Barring a well-organized campaign by a candidate on a line such as the Working Families Party’s, that nominee would be the prohibitive favorite, as less than 9 percent of the district’s voters are registered Republicans. I began my career teaching and working with young people. In my first job as a counselor in a New York City day camp, I provided youth the recreational outlet and physical education that I believe is critical to their development. I used the skills I learned in the rec center gym when I began my work in New York City public schools coordinating after-school programs for our highest-needs students. Having grown up in modest means in the Lower East Side, I had a common bond with the parents, faculty and kids I served. I will continue to fight for the families and educators who want the next generation to do better than the last. And this all starts with a great education. That’s why I am proud to have the endorsement of the United Federation of Teachers (UFT), the labor organization representing NYC’s hardworking public school teachers, as well as PSC CUNY, which represents faculty and staff at our city’s public colleges and universities. But to get to work on building equity among schools and ensuring strong programming at every grade level, I need your help. With just 33 days left until Primary Day, I need you knocking on doors and making calls with me.